Many people says that it is not necessary to learn assembly level in order to deal with Embedded C language, i agree with them as well disagree too. In order to do microcontroller projects based on C it is not necessary to learn assembly level programming but it is preferable. If a person who code using C language he will not understand what's going on inside the microcontroller. If we know assembly language then our mind will think in the same way, so it will be easy for us when we write code using C language. Look at the block diagram of 8051 above, it is no need to explain each block because it is self explanatory but lets see all blocks one by one with brief explanation. Oscillator: It generates the oscillations(clk signal) to the microcontroller, to explain exactly its use, its similar to the "heart beat for a human body". The speed (execution of instructions) is depended upon the oscillator. i.e a 10Mhz crystal oscillator perform execution of instructions more faster than the 4Mhz crystal oscillator. I/O Ports: We have 4 I/O ports i.e p0 to p3, they are used for Input and Output operations. Serial Ports: serial port(tx and rx) are used to receive or send data serially. Memory: RAM and ROM are inbuilt in the chip(8051 mc) . RAM(Random Access Memory) it is used to store data temporary and ROM is to store data permanently. Our program will be saved in ROM because even after power is off we need not to loose data. Interrupts: We have two hardware interrupts. You will see soon in further posts. 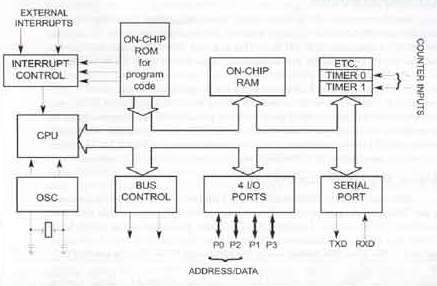 Observe the above Pin Diagram, it consists of four Input/Output ports i.e P0, P1, P2, P3. Pins 18 and 19 is used to connect crystal oscillator, pins 10 and 11 are used for Rx and Tx for serial communication, pins 12 and 13 are interrupt pins, 14 and 15 are timer pins and 16,17 for WR and RD pins respectively..
What is difference b/w Tx and WR both sends data? I know functionality of Tx, RX. The HUMANOID robotic ARM using pic microcontroller The purpose of the HUMANOID robotic ARM project is to implement the position control and vision control on the robotic arm. Which in my opinion is one of the best things happening and even KLDS and http://microcontrollerslab.com/ talked about this.